Around 1912, Major of Semarang, W. Th. De Vogel ask the architect K.P.C de Bazel who works in Amsterdam, Netherlands to made a plans for the Semarang city extension plans over the hilly area in its southern part, known as Candi neighborhood. This idea was based on the advice of one's of city council boards, Dr. H.F. Tillema, a pharmachist an enterpreneur who really concern on the hygiene problems. He stated that in Semarang city which consider as coastal city, its lower part were unhealthy. Its density and also the problems with the heat condition of Benedenstad, the plain part of the city which belongs to the city center combined with the high humidity, made its easily for the people suffers from heat fatigue. Thus, He advised several idea regarding the hygiene improvements project such as, sanitary improvements, tap water networks, and also the extension of the city into its hilly area in the south. Puskesmas Candi Lama. The photos taken in 2007. In 1915, Directeur van Burgerlijke Openbare Werken (BOW), the Department of Civil Works asks Ir. Herman Thomas Karsten to designs the master plans to the new settlements area in this hilly area. The area then well known as New Candi, in Dutch known as Nieuw Tjandi or Candi Baru in Bahasa Indonesia, which still used until now. Well, if these area given name as New Candi, so where’s the Candi Lama (Old Candi) located? Actualy, the area that in Dutch known as Oud Tjandi, were a residence area that lies in the southern hilly part of Semarang, start from Tanah Putih, until Jangli area. The toponym of Candi which must be refers to temple were still a mistery until today. No one’s know for sure where the temples location that refers to this name, but there’s an ancient structure found in Candi Lama, in the shortcut way from Jangli to Karanganyar Gunung, nearby the Sendang, a natural water sources. 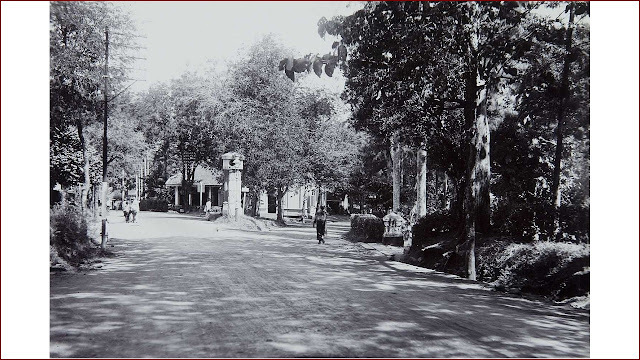 Many peoples believed that this was the location of the temple that later became the toponym of this area. Not so many discussion about Candi Lama neighborhood compares to Candi Baru neighborhood, which actualy it has a bunch of historical fact that for Me its also exciting. 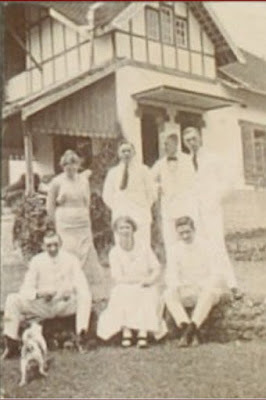 Once I met with Ron van Der Wal, whose His wife’s great grand-father, was the first headmaster of the first Heuvelschool (Hill School), the name was Mr. Goedhart. The Heuvelschool was still stand, and used as Puskesmas (smallest unit of people healthcare services provided by government) of Candi Lama. Across the Heuvelschool, was the location of Hotel Tjandi, a famous Hotel in Semarang that popular for its swimming pool. It was turns into the military compound after the indepence of Indonesia, and around 1990’s decades unfortunately its demolished. 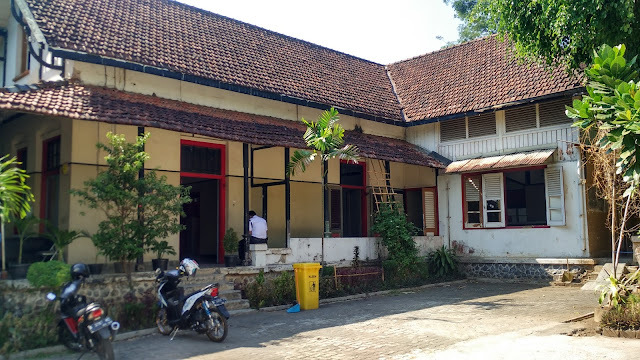 The house of Goedhart itself, was also interesting, since its later used as the Hulp Postkantoor, a post office branch that served the hilly parts of Semarang known as Heuvelstad. The buildings also still stand till today! Its even just renovated recently and maybe would be reused as another commercial function probably. The only buildings that remains in Nederlandsch Indische Gas Maatschappij (NIGM) complex in Gang Schmalz (currently Jalan Singotoro Raya), Candi Lama. Some people said that behind this building, there was two large tank made of steel. Its probably part of the gas instalation in the past, but unfortunately its gone. with Tudor-style remains in the neighborhood. There’s a street in Candi Lama neighborhood known as Gang Semal, which actualy taken from the old names of this street, Gang Schmalz. Many of the residents surround it, or even Semarang people still called the street as Gang Semal, although oficialy the name is Jalan Singotoro Raya. There’s a lot of historical building surround here, like Sanatorium and the Nederlandsch Indische Gas Maatschappij (NIGM) complex. The NIGM complex, there’s a big possibilities that before there’s a gas power plant set up here. Before the electricity installation based on cable, they used the gas network fueled by coal to enlightened the street and house. The gas power used as electricity means in Semarang was mentioned in De Locomotief, the prominent newspaper based on Semarang that in February 2nd 1898, in Semarang succesfully set 15 gas instalations in order to fulfilled the need for street lighting. The complex of NIGM itself only leaving one building remains. The building once turns into a famous café in Semarang, Ours Café where one’s of the city Jazz community, Jazzngisoringin established in 2009 through its routine agenda of organizing Jazz gigs in the small stages under the Beringin tree (latin: ficus benjamina) on its yard. Unfortunately, its closed in 2010 and left the building neglected until recently the owner which is now PT. Gas Negara made a little renovation. There’s much more old building that interesting to see in this neighborhood such as the building nearby the Y-junction of Jalan dr. Wahidin and Jalan Sisingamangaraja (before known as Kanarie Laan, since a lot of Kenari trees over here) which consider as the only building with Tudor style that remains in Candi Lama. Also the art-deco house that designed by Liem Bwan Tjie that situated near the junction of Jalan dr. Wahidin. The house with its steeping entrance for sure has a best view towards the Java Sea and the lower part of Semarang among the others building in the neighborhood. The Badjak Bron a natural water resources that once served pipeline water network in several area in South Semarang its also located in Candi Lama. The water sources nowadays still used by the people in Karanganyar Gunung neighborhood. Wish it always be preserved anyway.